From October 21 to 26, IEEE VIS 2018, the largest international conference on scientific visualization, information visualization and visual analytics, took place. This year’s VisWeek was located the very first time in Germany and the second time outside the United States; it was hosted in the Estrel Hotel Berlin – Germany’s largest hotel. With 1265 participants from around the world a new record number of attendees was reached. 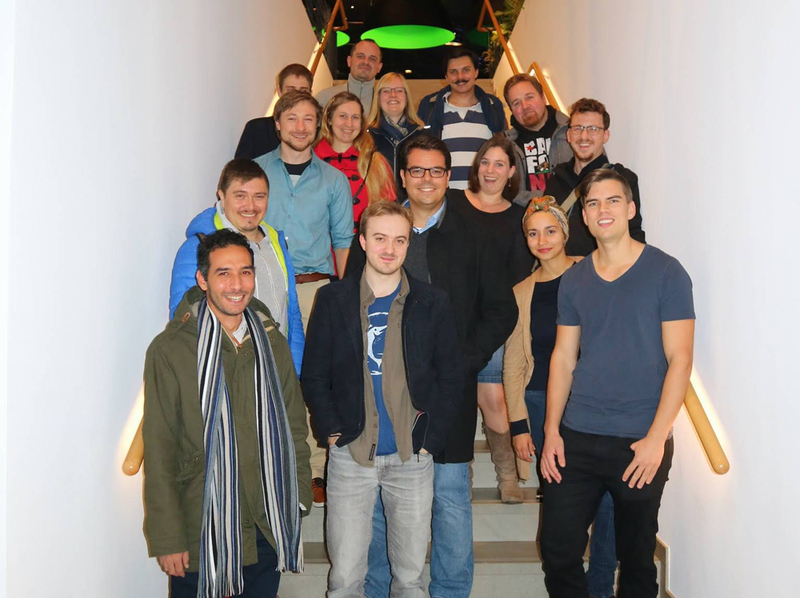 I attended the conference together with many other researchers from Stuttgart, from the Visualization Research Centre (VISUS) and the Institute for Visualization and Interactive Systems (VIS). We had the opportunity to present and discuss our current research and to get in touch with other researchers and exchange ideas. The conference program had to offer a variety of different meetups, workshops, tutorials, panels, poster presentations and paper sessions in multiple tracks. The topic of all events covered many different areas related to visualization such as data visualization, visual analytics, evaluation techniques, and machine learning. Both the Keynote and Capstone presentations were very interesting and inspiring talks. Dieter Schmalstieg from Graz University presented the Keynote about augmented reality and visualization. The Capstone presentation, which was the last event of the conference, held by Joachim M. Buhmann from ETH Zurich, was related to challenges and the future of artificial intelligence related to visualization. During the conference, there were further keynote presentations for specific tracks or events colocated at the main conference. Among them, Thomas Ertl from University of Stuttgart held the keynote presentation for LDAV (Large Data Analysis and Visualization). 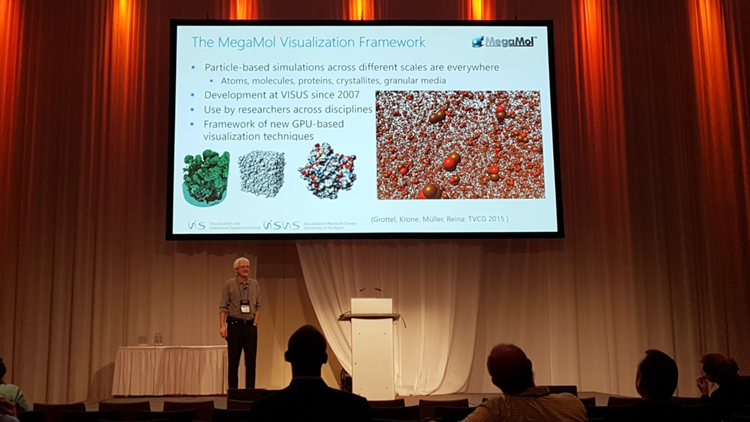 He presented different work that was created by the VISUS group in Stuttgart related to interactive analysis and visualization of large data sets such as dynamic volumes and particle data sets. Keynote presentation for LDAV (Large Data Analysis and Visualization) by Thomas Ertl (Photo: Patrick Gralka). For me, especially the talks related to information visualization, visual analytics and explainability of machine learning were very interesting. Machine learning and AI are a growing topic in computer science and understanding and explaining their underlying models becomes very important. Multiple sessions were dealing with this topic; there was for instance the Workshop on Visualization for AI Explainability (VISxAI), where different approaches towards explainability of machine learning were presented and discussed. To encourage the collaboration between researchers from China and Germany, there was a Sino-German Visualization Workshop, organized by Oliver Deussen from Konstanz and Yunhai Wang from Shandong University. In this workshop, students from China (Shandong and Zhejiang) and Germany (Stuttgart and Konstanz) prepared posters and discussed their research. Some social events were included in the conference as well. At the first evening there was the Opening Reception; another evening event was the VIS Arts Program Opening Event where different projects at the intersection of art, visualization and research were presented; the highlight was the VIS Dinner Banquet, where a large hall was filled with participants enjoying the food and discussing their research. In general, it was a great and very interesting week at the conference and I could gather lots of impressions on many visualization topics. This was the group of VIS & VISUS researchers who visited IEEE VIS 2018 in Berlin. Tanja Munz is a PhD student at the Visualization Research Center (VISUS) at the University of Stuttgart in the group of Daniel Weiskopf. Her main research interests are information visualization and visual analytics for application domains such as eye tracking and machine learning.